Whether you're frying or gently simmering, you can cook with precision using this Belling LPG Hob, which allows you to alter heat intensity with instant effects. Plus, you can prepare meals for the whole family and use your heaviest cookware on the cast iron pan supports, which will provide you with reliable support while you're cooking. Operation is easy - simply push and twist the auto-ignition burners for instant flames. You can also avoid accidents while cooking, as you don't have to place your hands over hot pots and pans thanks to the front facing control dials that provide safer access. PLEASE NOTE: This hob is to be used with an LPG (liquid petroleum gas) supply only and not natural gas. Please note this product requires installation by a qualified Gas Safe engineer. This product requires hardwiring to a 13 Amp fuse and should be installed by a qualified installer. 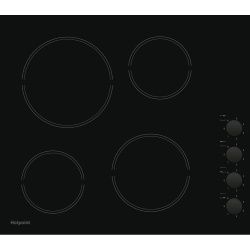 The Hotpoint HR 619 CH Built-in Ceramic Hob in stylish and contemporary black glass finish measuring just under 60cm with 4 cooking zones and 4 knob controls. 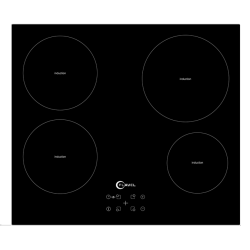 This Ceramic Hob is fast, energy efficient, clean, safe and controllable saving you time and money over sealed plate hobs. 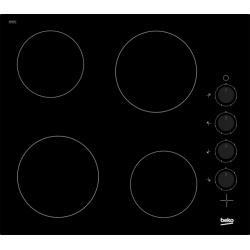 The Belling CH60RX 4 ring ceramic hob is easy clean due to its sleek ceramic top. The Belling CH60RX has 1 large 2.1 KW, 1 medium 1.8 KW and 2 small 1.2 KW rings. The CH60RX has the feature to tell you when it is still has enough residual heat to cause a burn thanks to the hot-hob indicator. With the pureflame gas burner, your pan reaches the right temperature straight away. Turn it on, and the entire base of your pan will instantly heat up. 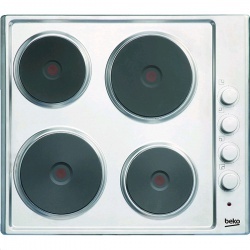 With the control panel and power-level indicator ideally placed on the very front of this hob, left-handed and right-handed cooks can use them with equal ease. The triple-crown gas burner on this hob gives you the searing, instantaneous heat you need to easily turn out perfectly cooked stir-fried dishes. Preparing meals on this gas hob is even easier and safer, thanks to the specially shaped supports that keep pots and pans completely stable while you cook. Along the side of this hob are the rotary control knobs. 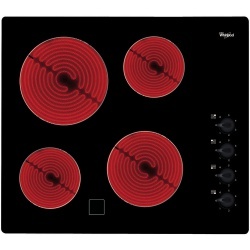 They're designed to be easy to twist and turn when you change the power levels of your hob. 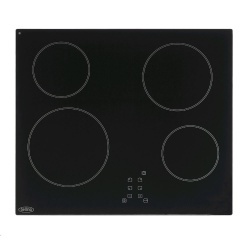 The Electrolux EHF6140ISK Electric Ceramic Built In Hob comes in a sleek black colour and is frameless. The EHF6140ISK has a residual heat indicator feature where the indicator lights stay on until the surface has cooled down to a temperature which is safe enough to touch. With this hob, you always know exactly which zones are still hot, thanks to the residual heat indicators, which cleverly reveal where the heat is. The ceramic glass surface of this hob is so easy to clean. A simple wipe, and you are done. Because this hob is independent, you have way more flexibility to install it wherever you want to. Choose the location that suits your cooking style. 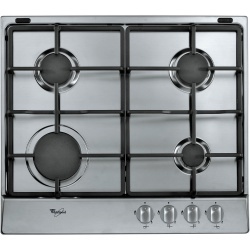 This gas hob features high-quality pan supports that are more heat-resistant and durable. You can count on them to stay strong and sturdy, meal after meal. Design Black with Stainless Steel frame and flush, easy to clean controls. Black with Stainless Steel frame and flush, easy to clean controls. 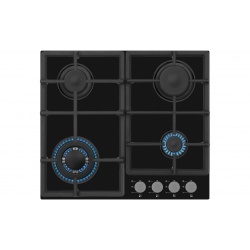 The ZGH66424XX is a versatile gas hob from Zanussi that features four pure-flame burners of varying sizes to cover all your cooking needs. The stylish frame design helps keep spills contained, for easier cleaning. As a gas hob you can get instant heat to get cooking straight away, and it also offers precise flame control so you can easily simmer or boil at just the turn of a knob. The cast iron pan supports offer sturdy and stable platforms to support heavy pots and pans, and safety is further enhanced by the flame failure safety feature. This gives you the peace-of-mind of knowing that if the flame accidentally goes out the gas supply is automatically shut off. 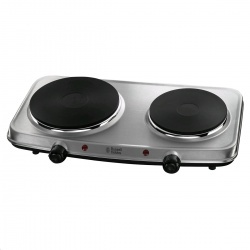 In addition, the hob is easy to use with front-mounted controls and easy auto- ignition. You just turn the knob to release and light the gas in one smooth motion. The pan support is designed to give you more space and stability for large cookware. Meaning that if you're putting a pot down or moving pans around, everything stays steady and secure. Please note this product requires installation by a qualified Gas Safe engineer, such as one of our Team Knowhow installers. This product includes a plug and can be connected to a 13 Amp socket. The Whirlpool AKR311IX Gas Hob in stainless steel delivers flexible cooking options to help you get creative in the kitchen. The Whirlpool AKR311IX Gas Hob includes four burners of three different sizes so you can mix and match the pans you use when cooking to get the best results. Use pans of different sizes at the same time and nothing will get in the way thanks to the spacious design, plus with front controls for convenient use, you will always be able to have full control of your cooking. The AKR311IX has cast iron pan supports which are both high quality and durable. Additionally the hob takes little effort to maintain with the easy-to-clean surfaces. There is one easily cleanable base plate so you can mop up any spills and splashes. All it takes is a damp clean cloth and the original shine will return. 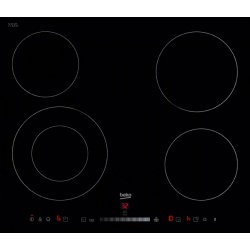 Buy the Whirlpool AKR311IX Gas Hob if you want a powerful cooking device that won't let you down. Dishwasher Safe Enamel Pan Supports? Automatic Gas Cut-out for Safety? Able to be Plugged into a 13amp socket?